You've heard of it, some of your friends do it, and you want to try it. Digital cameras and photography; what's it all about? It requires an investment — a new camera and memory for the camera — a computer, if you don't already have one, or a better computer if you have an old one — and software for editing your images, although most digital cameras come with minimal software. Getting into digital photography also requires a willingness to learn new stuff. How does the camera work? How do the photos compare to what I got with my old film camera? How do I print the photos to show friends? How do I store my photos to show the kids when they're grown up? Let's start with the basics. Digital photography does not require film. When you use a digital camera you no longer need to buy film or visit the one-hour photo shop to get your pictures developed. Your pictures are captured by the camera and saved on some kind of digital storage device. 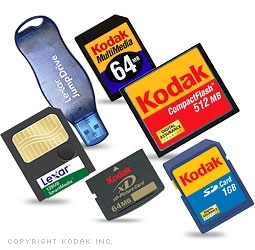 Currently, popular storage media for digital cameras are (in no particular order) SD and SDHC cards, Compact Flash cards, xD Picture cards and Memory Sticks. You can get some of them with up to eight gigabytes of storage. That's a lot of photos. Having said you no longer need to buy film, we should clarify by saying if you intend to take lots of pictures on your upcoming trip to Kathmandu, you'll need to stock up on memory. Initially, memory for your camera is more expensive than film but it can be used over and over. When you get home from your trip, you download the photos from the memory cards to your computer, erase the cards and plan your next trip. Belize this year? Taking photos with a digital camera differs a little from a traditional film camera. Although they've been getting better, we've found it's more difficult to be precise about capturing photos at the instant you want. There is a slight lag from the time you push the shutter button until the image is captured. Further, it's difficult to capture multiple images in rapid succession since it takes a moment for the camera to record each image before starting on another. Many modern digital cameras will capture full-resolution images at two or three shots per second, if you set them in advance to do so. This might be the best way to get action photos. Look for such a camera if that's the kind of technique you're after. Getting a little more technical, when deciding on a new digital camera, resolution should be the primary concern. A few years ago, when first released, expensive digital cameras barely captured a million pixels of data (one megapixel). The resulting photos were inadequate for most purposes. These days, most affordable digital cameras capture six or eight megapixels. In point and shoot pocket-size cameras, the small size of the image sensor limits the quality of the image no matter how many pixels are packed onto that sensor. With that type of camera, consider that you might get better pictures with a sensor that actually has fewer pixels. 10 or 12 megapixels might be over doing it. Six seems to be best. Another big positive for digital photography is "instant gratification." 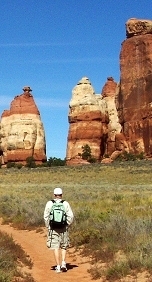 As soon as you get back from your hiking trip, you can hook your camera up and view your photos immediately. Most folks like to have prints of their photos to take to the party and show around. This has been a problem with digital photography. It's very easy to show off your photos on the computer, but how many of us carry a computer in our pockets? Things are changing. There are inexpensive ink jet printers now to plug in your memory card and push a button for a print of each photo on the card. Software improvements simplify this process allowing you to eliminate the unwanted images before the printing process begins. It's not always as easy to get a handful of digital prints as it has been with film at your one-hour processor, but many shops will now make prints of your digital photos. We know what you're probably thinking by now. For someone touting digital photography, these guys sure are being awfully negative. Just so you'll be sure, we LOVE digital photography. We want to warn you about all the little gotchas you can expect before you take Step One and go making the serious investment that digital photography requires. With careful photo editing, even if your pictures aren't perfect, you have a lot of control to make them better. You no longer have to go back to the processing lab begging the technician to bring out more detail in your shot of the Statue of Liberty. You can sharpen, adjust color and contrast, lighten, darken and even crop out the tip of your finger. Most digital cameras come with photo editing software that is up to the task, so you won't need to spend a fortune on software unless you want. If you do, there are products like Adobe Photoshop, Corel Paint Shop Pro, Serif PhotoPlus, Ulead PhotoImpact, and ACDSee Photo Editor that are almost like magic. Another big positive for digital photography is "instant gratification." As soon as you get back from your hiking trip in the Grand Canyon, you can hook your camera up to the computer or to a television and view your photos immediately. No more trips to the film lab, waiting hours or days for the prints or slides to come back. With an inexpensive ink-jet printer you can produce high quality prints right in your home, making enlargements of your favorites for a fraction of what you'd pay a lab. All in all, you will discover as have we, that digital photography is the way to go. Be prepared for the initial expense; a good camera and printer might set you back up to US$1000, although you don't have to spend quite that much. Also, be prepared for the learning curve. The higher end cameras can be somewhat confusing at first and learning how to download and adjust your photos might seem a little daunting. However, when you see how much fun you're having and what great pictures you get with practice, you'll be glad you took the digital plunge. If you have made the decision, please continue with our other articles as we delve into the details of how to enjoy this fabulous hobby to its fullest.